Like a scribe, I furiously copied every word while Brayton emoted. I had the sense that this might be one of the most powerful experiences of his life, and it was. This began my journey into what the riveting film by Josh Fox, “Awake: A Dream of Standing Rock,” depicts as a descent into a dreamlike archetypal state evoking images of water and life, of Native people reclaiming their place in the universe, with a code of conduct emphasizing prayer and nonviolence. Long before the historic Standing Rock resistance, many of us had been protesting fracking and fossil fuels, attempting to close operations at Vermont Yankee Nuclear Power Plant, including Brayton’s arrest in Vermont. Later, we joined with others nationally at rallies in DC and elsewhere to stop the XL pipeline. We all know the dreadful scenarios that have played out since Trump’s election, unimaginably depressing, but it is imperative for us to remind ourselves of their dreadfulness. XL is back on line. DAPL (Dakota Access Pipeline) flows again at Standing Rock. In our own back yard, at the Otis State Forest in the gorgeous hills of The Berkshires, tens of thousands of trees were slashed with the rapidity our friend Hattie described in the Agape living room one night to a group of college students: “Swish, swish, swish” noble trees falling like sticks, one after the other, killed by gigantic monsters of destruction. Trees and their life force, their living presence suddenly became very real. I was able to view the devastated forest in the last week of July when Dixon, Brayton and I went to Otis State Park to a rally sponsored by the Sugar Shack Alliance, a group of environmental activists committed to resist the Otis Forest decimation, if necessary with Civil Disobedience, which they have done many times now, with numerous court dates pending. Members of the Sugar Shack alliance “seek to protect the air, water, soil, flora and fauna of our commonwealth and our planet.” Inspired by their efforts and the arrest of our dear friend and resister, Frances Crowe, age 98, at the site of the construction in Sandisfield, we joined with many of the alliance members whose intention it is to “nonviolently disrupt the fossil fuel industry and work toward renewable energy and climate justice.” The work of Sugar Shack speaks to us at Agape in our sustainability efforts as one of the key elements of our community life (driving an electric plug-in car, construction of a straw bale house, solar energy, growing our own food, a compost toilet). Visible throughout our drive through the pristine woodlands were mile upon mile of above ground pipes waiting to be buried like gigantic green snakes, instead of black ones (Black Snake is the name given by indigenous peoples to the pipeline at Standing Rock and across native lands and holy sites). The reality of the pipeline under construction and the trucks, cars and personnel visible and engaged was a devastating prelude to our meeting of fellow-activists, including Susan Baxter, a woman who owned property through which the pipeline would pass. Susan quotes Kinder Morgan as promising construction in “a safe fashion.” A defiant Susan called out to all of us: “Safe for whom?” Susan spoke of the corporations claiming the right of Eminent Domain to seize her property, the result being her irradiation from chemicals and extraction debris from the positioning of the pipeline, with no buffer protection between the construction site and her property and home. In a steady, non-aggressive voice, Melting Tallow spoke of the need to “stand up to the extractive industries by walking the good path to reinforce our kinship to everything around us.” Further, he reminded us that “in these precarious times” being on the “right path” means that we will not let “greed stop us.” From Kinder Morgan in Massachusetts to Alberta Canada, Anthony pointed to the “46 billion dollar infrastructure” that is despoiling Turtle Island, the Native name for our planet. In a moving conclusion, Melting Tallow spoke of the need for personal sacrifice if we are to honor carrying life forward. 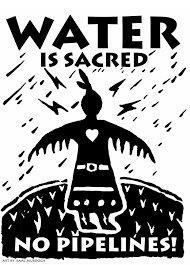 Those of us who are “water privileged” need to realize that by praying and fasting as Native Peoples had done recently for four days, we make the physical sacrifice that helps us to “walk in a good way” ending our fast by first drinking sacred water. Serious and inspiring, Anthony Melting Tallow, spoke of the need to sacrifice for the elders, the children and youth. “I am hopeful. We wouldn’t be here if we weren’t hopeful. We are gaining more than we are losing. We are bigger. Creation is bigger than the pipeline, so we don’t hang our heads in disappointment. We feel our love of creation, honoring creation back, honoring our ancestors, the four-leggeds, the winged.” With these words, Anthony opened our gathering. The horror of the green snake receded in my mnd..
One of the singers, Ben Grosscup, musically reinforced the Anthony’s prayer with a song entitled “Sacrifice Zone,” the name given to the forced removal of Native Peoples from their lands so that large swaths of Indian country was open to coal, uranium and mountain top extraction, turning Native lands into Sacrifice Zones. No more Sacrifice Zones became the nonviolent cry for ending violence on the planet.